A sophisticated ceiling lift system that allows a single caregiver to perform transfers of bariatric residents under handset control without stress or strain and with no manual lifting. 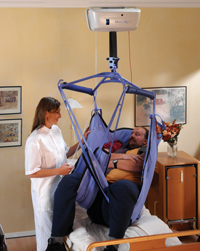 • Maxi Sky 1000 allows safe, comfortable and dignified transfers of bariatric residents. • The lift cassette can be installed on a semi-permanent gantry or a permanent ceiling-mounted straight track. • A full range of bariatric loop or clip slings can be attached to the four-point sling bar. Maxi Sky 1000 is simple to operate. Regulation of lifting speed and spreader bar height is programmable from the handset. Several features brake, lowering system and cord-pull stopping device safeguard the resident in the event of an emergency. The unit is always ready for use. Immediate electronic soft-start and soft-stop means there are no delays or “overrun”, ensuring the lift can always be stopped exactly in the required position.